Oh, and by the way, the Sewing Alphabet below is now available here and here. Lovely illustration…I would surrender to lovely sweet snacks too! I see that the snack fairy is a little round around the edges. I guess she has to sample her wares. Unfortunately I surrendered to her charms more than I should have today! What a sweet illustration! I would have DIED to have such a cute fairy in my room when I was little. She looks so joyful and fun! On January 11th I felt something under my pillow. I reached under it and pulled out a cupcake! I always heard about the snack fairy, but it wasn’t till this year that I finally believed…. and now you are surrendering your wand? Who can fill those ballerina slippers? :o) Great lines and movement in this Krista! Wonderful character design! Hey congrats in getting into the first 12 submissions! You are quick! Hmmm…I have my own snack fairy! lol! Wonderful illustration! Oh no! And you left all those hungry people? Love the thought of a ‘snack fairy’. Oh, but you will always be an honorary Snack Fairy! What’s that saying? 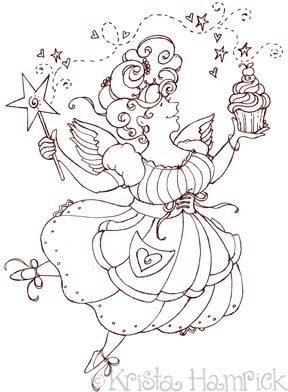 Whenever an egg timer dings, a Snack Fairy gets her wings…? This is an enchanting and wonderful drawing! Delicious! very cute Krista, love your valentine theme! I love your former title of “snack fairy”. What a delightful line drawing! She’s a delightful snack fairy! YUMMMY cupcake, too! I surrender to the sweetness! I just popped over to see your work at the stitchery! How cool. I love that. You can come to my house anytime! NICE drawing! It’s just the perfect illustration for surrendering yourself to a cupcake; not a bad thought for a Friday.